ESPN announced that they will be laying off around 100 people—dramatically restructuring the product of America’s largest sports network (this is not the first time they have made massive cutbacks lately). Mainstays like MLB writer Jayson Stark and NFL reporter Ed Werder have been let go, along with a wealth of on-air talent. If the early cuts are any indication, ESPN is rolling back its reporting, as most of those laid off are not part of the sports punditry it has become famous for (like professional contrarians Stephen A. Smith and Skip Bayless, the latter of which has since fled to Fox Sports 1 in their attempt to become somewhat of an ESPN copycat). However, some of the recent punditry that ESPN dabbled in has ruffled some feathers, as they have injected liberal politics into their broadcasts. Jim Brady, their public editor, said as much in a column this past December. This has rankled many on the right, as they feel alienated from ESPN’s coverage, and many have claimed to have stopped watching ESPN precisely because of this leftward shift. However, in a classic case of confirmation bias, many in conservative media are equating their boycott of ESPN with its decline in ratings, thus leading to these massive layoffs. That said, I'm eager to see other channels more passionate about sports than making political statements take over. When you pursue a political agenda rather than a business agenda and people lose their jobs, remember: No One Is To Blame. In November, Ben Shapiro wrote at The Daily Wire that “ESPN has been hemorrhaging viewers because of its outspoken politics.” Dan McLaughlin wrote an article today at the National Review which is far more nuanced than the title suggests (ESPN Layoffs Should Be A Wake-Up Call About Politicizing Sports), but the overall point amongst many conservatives has been the same: if you antagonize us, we will abandon you, and this is responsible for the reduction in your bottom line. It's a reasonable assumption. A significant portion of this country identifies as conservative (particularly sports fans), and likely an even larger portion would like to watch sports without any political lean to it. Sports are supposed to be an escape from the conflicts of the daily grind even though they resemble a metaphor for life in general. However, this is an inherently privileged position to take. Telling a woman who has been a victim of domestic violence that the NFL is a retreat from that reality requires her to forget about Ray Rice punching his fiancée, Jovan Belcher murdering the mother of his kids and then committing suicide in the Kansas City Chiefs parking lot, or any of the other 854 documented NFL arrests since 2000 for things ranging from a DUI to first-degree murder. Sports are the only “non-political” arena where we play the Star-Spangled Banner prior to the event—a song that is literally a political anthem. Telling someone like Colin Kaepernick not to politicize the event in order to honor a country he has conflicted feelings about is a political position in of itself. As much as we want to separate sports from politics, they share a similarity at their very core: sports are where we retreat to exercise our tribal instincts (my city is better than your city! ), and politics are where we legislate them. ESPN's leftward shift was an admission of the impossibility of remaining apolitical, and the direction they veered is simply a reflection of where the country is moving. If there's one thing we should know about Corporate America by now, it's that they will never put politics above profits. If 60% of the population believed that we should impose the harshest forms of Sharia Law, ESPN would be airing nightly beheadings. That collapse has been aided by ESPN's absurd decision to turn into MSESPN, a left wing sports network, but that's more a symptom of the collapse than it is a cause of the collapse. ESPN's layoffs are almost entirely due to an outdated business model whose comeuppance has finally arrived. Their prime-time ratings have been falling since at least 2011. By all accounts, their subscription base peaked in Obama's first term, and has been declining ever since, accelerating in 2014. Last November brought their largest single month subscriber decline in their history, as they lost twice the number of subscribers they had been losing on average. In the span of five years, ESPN shed roughly 12 million subscribers, or put another way—nearly the populations of New York City and Los Angeles combined. ESPN's entire business model is predicated on subscriptions, and so with the declining number of total cable subscriptions, it should come as no surprise that ESPN's bottom line would take a proportional hit. 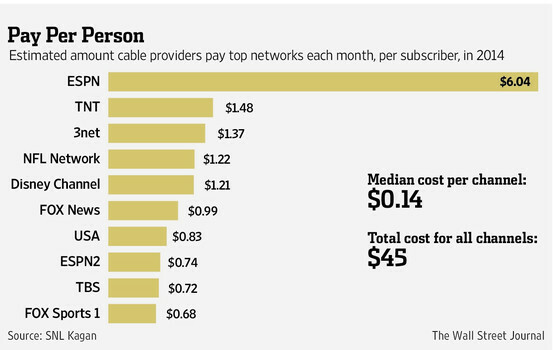 Additionally, the high price of cable packages is due in part to ESPN's outdated business model. The median cost per channel in an average cable package is about 14 cents, but the cost for ESPN alone is around six dollars—over 400% more than the second most expensive channel (TNT). In 1998, when NBC walked away from the contracts because of how big and ridiculous they were, CBS and FOX signed up for deals that made them lose a hundred million dollars a year. So they're paying four or five hundred million dollars a year, and losing a hundred because they can't pay back the expense of advertising money. These decade-long contracts, combined with the death spiral ESPN finds themselves in with cord cutters, are directly responsible for today's cuts—not politics. 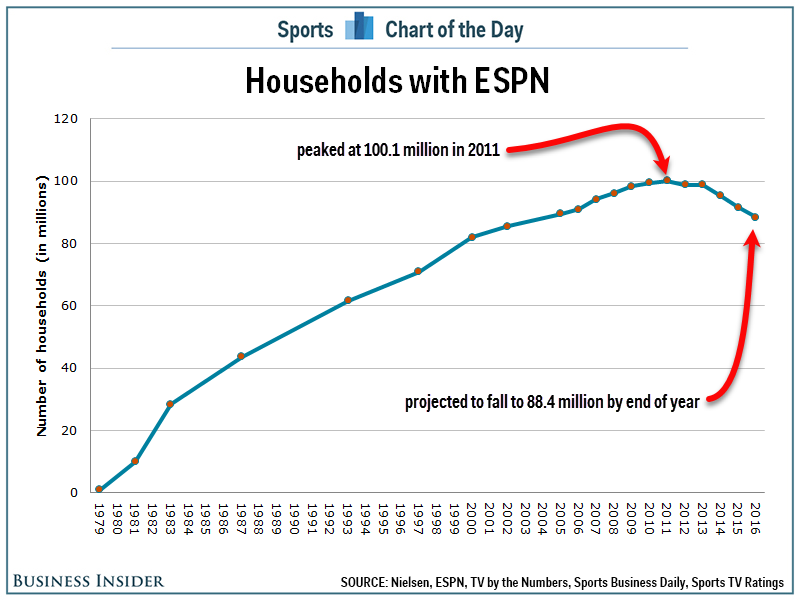 ESPN is simply the poster child for the larger trend of cord cutting. In 2011, less than two percent said they would cancel their cable service in the next year, and by 2016, that figure had risen to about six percent (nine percent amongst millennials). A study last year showed that a quarter of all American households do not have a cable subscription. Between 2008 and 2011, 2.65 million people cancelled their cable subscriptions, and this trend has dramatically accelerated since. In 2014, 8.2 percent of people said they abandoned their service—an increase of 1.3 percent from 2013. 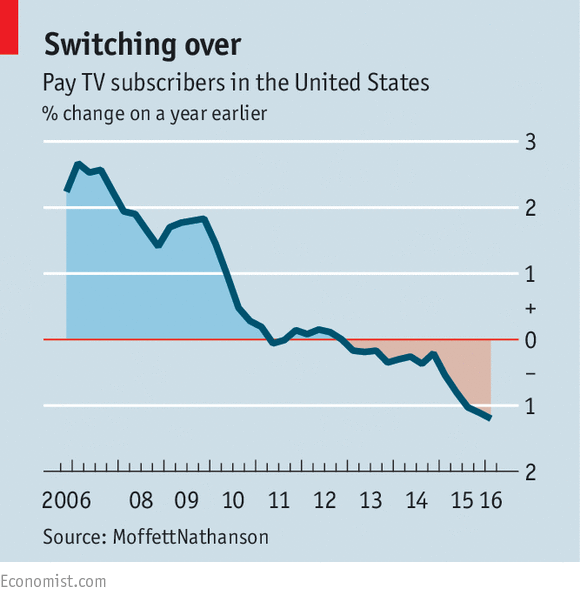 In 2015, this widescale abandonment escalated, with 1.1 million people dropping pay TV—four times the decline seen the previous year. In just the second quarter of 2016 alone, 812,000 people cancelled their service. This is a dramatic realignment that literally picks up speed by the day. You can basically chart ESPN's decline in tandem with the overall trend of people ditching paid TV services—which makes sense because ESPN is the most expensive portion of pay TV packages. Netflix opened a whole new world for television fans, and they and their competitors have slowly eaten away at the cable and satellite monoliths. Comcast, TimeWarner, DirecTV and the like have done everything they could to monopolize every corner of the American market, and the internet created a trap door to opt out of their scheme entirely. 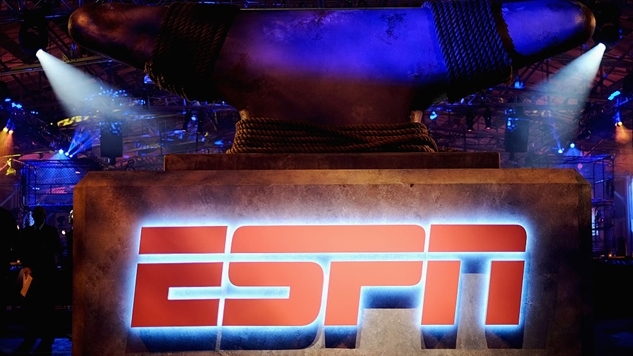 ESPN pegged their business model to this archaic structure, and now they are paying for it. My cable bill was more than my car payment last month. That's why people are dropping cable. Not ESPN's liberal politics. It’s reasonable for conservatives to feel alienated by ESPN’s leftward shift, but saying this grievance is to blame for ESPN’s dramatic drop in subscribers—which lead to today’s mass employee purge—is a textbook case of missing the forest for the trees.